Contact with blood or body fluids with persons with Hepatitis B. This is not transmitted with casual contact with infected persons. Management of pain and other associated symptoms. Adequate nutritional balance, including replacement of fluids that are lost from vomiting and diarrhea are implemented too. Chronic hepatitis B can be treated with interferon and anti-viral agents. Educate would-be parents that infants should have the hepatitis B vaccine. 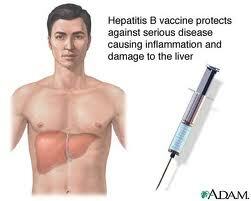 this is the mainstay of hepatitis B prevention. Inform that the certain protection may last for almost 20 years, updates of screening must be done. For blood donors, proper screening must be done in order to be sure that the blood being donated is Hepatitis B virus free. Assist in administration of Hepatitis B immuno globulin. Teach clients proper handling of blood and body fluids as well as practice of correct hand washing. Encourage clients to use yellow-colored garbage bag as a sign of infectious waste which is universally recognized. For persons diagnosed to be positive with Hepatitis B, assist in feeding them with small frequent meals containing high-calorie, low-fat diet. Listen to the family and the client as to any concerns about the alterations in the daily living due to the disease process. This entry was posted in Medical Surgical Nursing and tagged chronic hepatitis b treatment, hepatitis b symptoms, hepatitis b treatment, hepatitis b vaccine, hepatitis b virus. Bookmark the permalink. What is the significance of a low fat diet specifically with Hep B? Tiffany Lee Cornell the affected organ is the liver so you need to avoid fats. if someone is positive with this,can they still study nursing and work as a nurse after studies? The liver stores bile,bile emulsifies fat digestion. fat can not be digested if the liver is damage coz the liver produces bile to digest the fats so the diet must be on low fat and also low in (chon)protien. The gallbladder produces the bile and the liver only store it thru the bile ducts. will preval the deep optitions about the virus,the disease and signs and symptoms and etc. Tiffany Lee Cornell. The liver is the one emulsifies the fats. And It happens that hep.B affects the liver. – encourage the pt. To eat meals in a sitting position to reduce pressure on the liver. – encourage pleasing meals in an environment with minimal noxious stimuli (odors, noise, interruptions). – administer or teach self-administration of antiemetics as prescribe. Avoid phenothiazines such as chlorpromazine, which have colestatic effect and may cause or women jaundice. Uh oh I hope there is not bad news out there! Wheng Armeña, it’s the other way around: liver produces bile. Gallbladder stores it. @ Wheng armeña Bile or gall.produced by the liver and stored in gallbladder.. Kaya nga gallbladder… So storage sia ng gall..
Is there any cure of having hepa b? ?